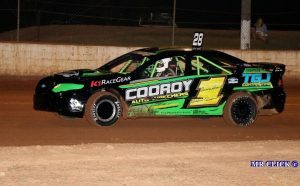 Can Gympie’s own Aidan Raymont defend his Queensland Championship Title when the Budget Steel Queensland State Modified Sedan Title hits the track at Corbet’s Group Mothar Mountain Speedway on Saturday 20th and Sunday 21st April? Aidan has already had a most successful season and now, along with many others, faces the prospect of two major title events on back to back weekends. Firstly to defend his state title at Gympie’s Corbet’s Group Mothar Mountain Speedway and then the national title at I.B.R.P Kingaroy Speedway the following weekend. Aidan is a master on Corbet’s Group Mothar Mountain Speedway; but, the list of opponents is quite remarkable. 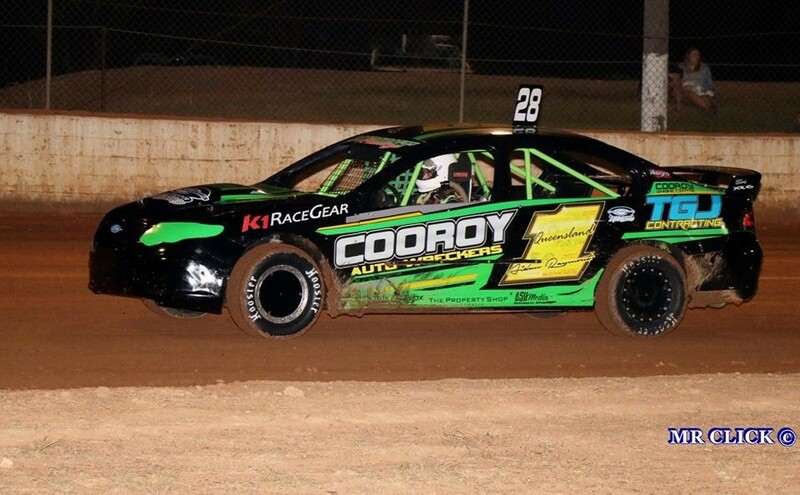 The big unknown in the field is certainly Chris Pagel who has won the Queensland State Production sedan Title and has decided to take on the Modified section for this title. He has already had a “practice” run in the Modified Sedan class coming home a very creditable second in a class field on his home Mountain track. Q1 Aidan Raymont; G2 Chris Pagel; G4 Glenn Pagel; G5 Brett Baxter; SB5 Corey Stein; GL05 Richard Cook; B7 Steve Jordan; G8 Lee Steffens; CR8 Rodney Pammenter; CR9 Brett Watson; SB10 Stephen Geritz; G12 Luke Hollyman; G15 Tim Atkin; SB15 Pacey Clegg; V18 Jake Drewett; MK19 Wayne Gilroy; M21 Kent Shelford; SC22 Shannon Blackburn; MK23 Tim Smith; T25 Adam Jorgensen; G29 Jessica O’Meara; CR32 Nathan McDonald; V46 Kye Walters; SB54 Michael Shelford; M56 Darren Severs; C58 Tim Weir; V61 Matt Nelson; WA74 Allan Mortimer; M75 Myles Gilroy; CR78 Peter Gray; C89 TJ Horne; G97 Brad Yarrow; G116 Aaron Sander; G197 Rory Evans.